"You never know your own neighbors…" Fears about your neighbors being psychos turned into a movie, oh how fun. 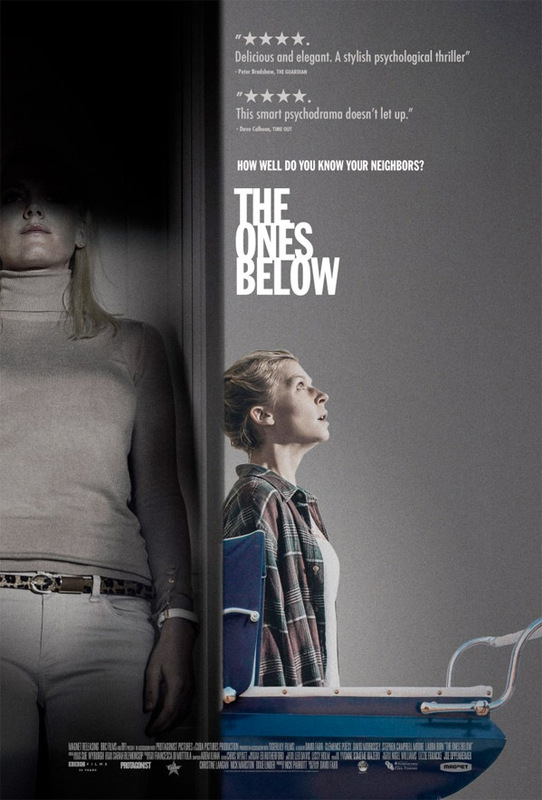 Magnolia Pictures has debuted a new trailer for the thriller The Ones Below, about a new couple expecting their first child that learns something a bit weird is going on with the couple living below them. Clémence Poésy stars, along with a cast including David Morrissey, Stephen Campbell Moore, Laura Birn and Deborah Findlay. This film has been playing at film festivals like TIFF, London and Berlin so it can't be all that bad, but it doesn't look like that much to it from this trailer. Take a look below. A couple expecting their first child discover an an unnerving difference between themselves and the couple living in the flat below them who are also having a baby. The Ones Below is both written and directed by English filmmaker David Farr, making his feature directing debut after some writing work previously. This film first premiered at the Toronto Film Festival last year, and also played at the London and Berlinale Film Festivals, plus the Montclair Film Festival coming up. Magnolia Films will release David Farr's The Ones Below in select US theaters + on all VOD platforms starting May 27th, 2016 this spring. Anyone curious? Old concept. But a good one. I love REAR WINDOW. And enjoyed that bad DJ Caruso remake. To be honest...so did I...haha! !~~ But yeah don't tell anyone. Hm, ok, let's say it's interesting. I mean, suspense is here, acting seems ok but what's new? But then again, it will probably be better than most of movies this year. Hey Bo, how are you doing? Please, correct me for correcting you, but is the title of the film you mentioned In Burges or In Bruges? Since, that last title (B. Gleeson, C. Farrel and R. Fiennes, and others) was a great film, I can certainly agree with you about that. Hey Bo. Thanks for answer. Well, if I am too nice, I guess you are not far from that either. Are we overdoing it? Probably a bit, but it's good to be polite, right? And you are right again. I wanted to 'hear' from you a bit. I was pretty sure that this was totally unintentional misspelling from you. The fact is that you reminded me about that film (it was a long time since I watched it, but will probably never forget it - very nice cinematic experience) and it's good thing. I remember those details you're describing a bit dimly (however, I know they've been close to the end of the film) and they were quite full of dark humor but without cynicism and very human which is hard to achieve. And the conversation between Gleeson and Fiennes just before that was also a small wonder. But I also remember another detail, a character in fact, called Yuri (I think) - some kind liaison guy - who ask the questions about the finesses of English language every time he meets some Englishman and the annoyance of Gleeson and Fiennes when they later talk about it. It was very nice touch, very nicely done.It might not be for everyone, but I like that little thing ... Anyway, since I wrote another too long post, can I propose on the end, something similar but also worth your attention and similar to this one (maybe you had the pleasure to see it, but if not then...). It's a movie with Brendan Gleeson and it's called 'The Guard' (2011) ... It might a bit different, but, according to my humble opinion, still quite good and in some respect humane in many respects. Cheers Bo, and take care of yourself too. Definitely looks interesting but I wonder what the twist will be? It seems like it'll be a metaphor for postpartum depression, but we'll see. Looking forward to it! The Governor got his eye back!